Join us at The Preserve at Corkscrew – Model Showcase Event February 22 from 1-3pm featuring live music, refreshments, giveaways and model tours. Construction has already begun on Phase One. The first phase of the development including constructed model homes is expected to be complete in early 2012. Lennar and Pulte are planning to have new furnished model homes constructed and fully staffed for sales this season. Lennar and Pulte, two of the nation’s leading homebuilders, have been selected as the premier homebuilders for a brand new community in Estero, Florida. Both companies have a nationally recognized reputation for their superior quality and a strong customer service relationship to their homebuyers. 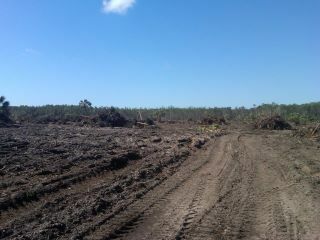 Clearing started today! 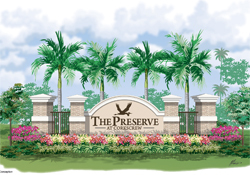 The Preserve at Corkscrew is a new 510 acre residential development in Estero, Florida with the main property fronting directly on Corkscrew Road, east of I-75 between the existing developments of Bella Terra and Wildcat Run. The area is characterized by many established upscale residential communities. Residents of The Preserve at Corkscrew will benefit from its prime location that boasts a wide selection of retail, restaurant, and entertainment venues, excellent K-12 and higher education schools, as well as easy access to I-75 and the Southwest Florida International Airport. Germain Arena, Miromar Outlets, Gulf Coast Town Center, Coconut Point and Florida Gulf Coast University are just minutes away. Your life at The Preserve comes full circle when you make the decision to become a resident. Oral representations cannot be relied upon as correctly stating representations of the owner. For correct representations, reference should be made to the documents required by section 718.503, Florida Statutes, to be furnished by the owner to a buyer or lessee. Not an offer where prohibited by state statutes.© Cameratta Companies 2011. All Rights Reserved.